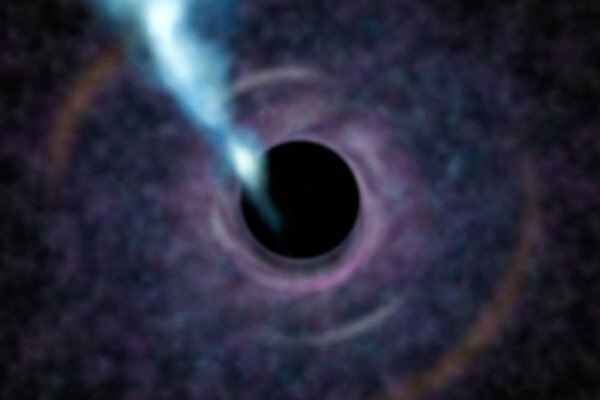 The cosmic gale from a black hole blows out ten times the mass of our Sun every year, which could keep a lid on star formation throughout the entire galaxy, according to a study published in the journal Science. At the centre of most galaxies lies a black hole, the collapsed remains of an ancient dead star that exerts an extremely powerful gravitational field. As matter is drawn close to the black hole it forms a rapidly spinning disc, known as the accretion disc. This disc gets very hot and emits some of this heat energy as X-rays. The most dramatic examples of this are known as quasars. When radiation like X-rays hits matter in space, it transfers energy to the particles and exerts a force almost like a wind. The team used NASA's NuSTAR, an X-ray telescope in orbit above Earth, to look at a quasar known as PDS 456, which lies at the heart of a nearby galaxy. They saw energised matter being blown away from the centre of the galaxy by the intense X-rays being emitted by the hot gas of the accretion disc surrounding the black hole. This X-ray-powered wind blows outwards in an almost spherical shape, expelling a mass ten times that of our Sun every year. This outpouring of matter could interact with the rest of the galaxy and prevent new stars from forming by blowing away gas that would otherwise gradually clump together to form stars. It's yet to be discovered whether this galactic wind reaches all the way across the galaxy, or whether its effects are felt only close to the accretion disc. These findings shed new light on the processes behind how galaxies form and develop, including our own cosmic neighbourhood, the Milky Way. Dr. Marc Sarzi, who wasn't part of the research team but is an astrophysicist at the University of Hertfordshire and has published several papers on black holes and their galaxies, explains the importance of the study: "This is very important because there are galaxies that have stopped forming stars a long time ago, and other galaxies like our own that have continuously formed stars throughout its history. It's important to understand how come we happen to live in a galaxy where stars have been forming continuously, like our own Sun, 5 billion years ago."